im Eisenbahnmuseum Darmstadt-Kranichstein e. V.
Welcome to ARGE HEAG e. V.
Unique in Germany: The "Feuriger Elias" in Darmstadt - Steam trains on the tramway tracks. 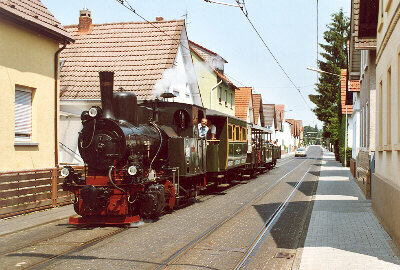 Public transport in Darmstadt started in 1886 with steam trains on narrow gauge. In 1897 an electrical tramway was inaugurated but the steam trains kept running until 1922. 75 years later we set up a new touristic train using the preserved material. 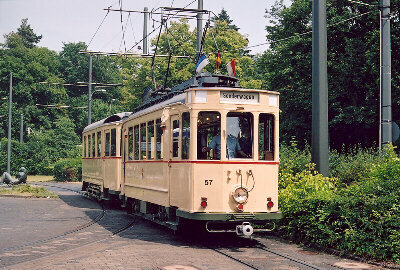 Since then you might enjoy the unique adventure of a steam tramway twice per year. We are sorry, but at this time most of our pages are only available in German. You might use Google to translate our website. The results often sound somewhat funny but it should be enough to unterstand the meaning.